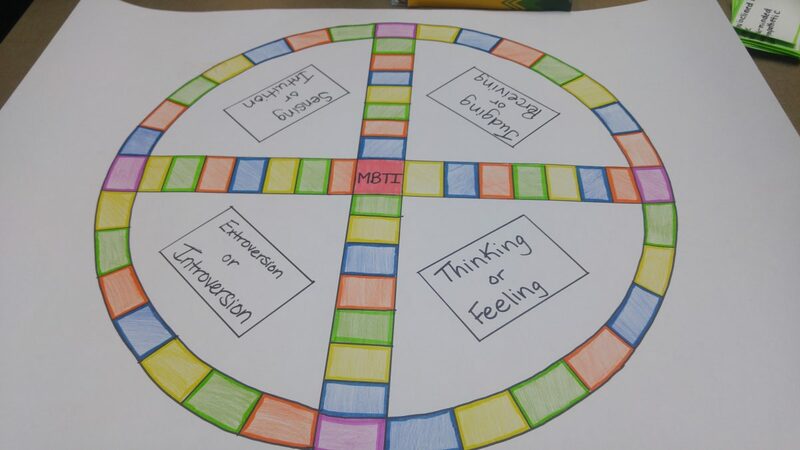 A board game which simulates the Myers-Briggs Type Indicator Personality Test. Designed for the Grade 11 College level Introduction to Anthropology, Sociology, and Psychology course (HSP3C). Meant to be played in a single class. Each board is suitable for four to eight players. Friedman, H. (n.d.). MBTI Personality Type Test. Retrieved November 12, 2016. MBTI Basics. (n.d.). Retrieved November 12, 2016. Across the Curriculum (11th ed.). New York: Pearson. Fisher, D., & Frey, N. (2016, March/April). Designing Quality Content Area Instruction. The Reading Teacher, 69(5), 525-529. Retrieved November 9, 2016, from https://blackboard.uwindsor.ca/bbcswebdav/pid-469945-dt-content-rid-1862523_1/courses/0580334-1-2016F/Fisher_et_al-2016-The_Reading_Teacher.pdf.